Without the legs, if they go that route, could F9 also land on drone ship with the right cradle for slightly larger payloads? Your idea does not work. Counterweights are not springs. The counterweight has a huge inertia. The rocket also has huge inertia. 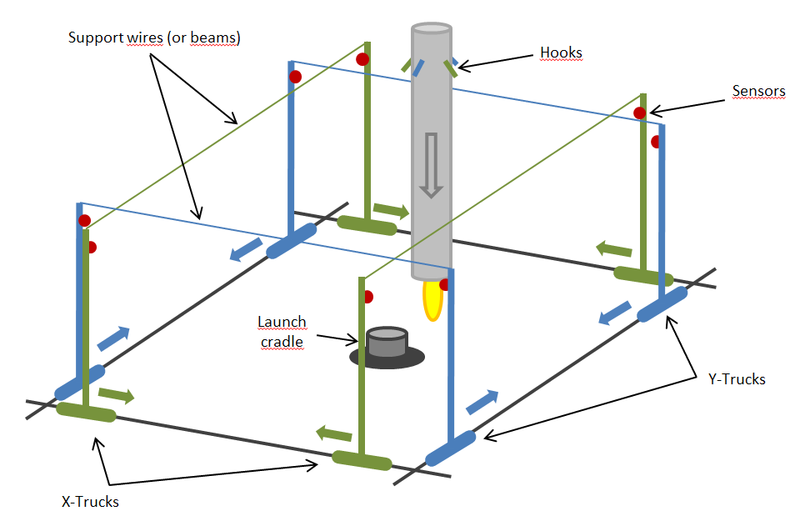 In your proposition the stationary counterweight meets a moving rocket in an instant. This causes huge instant force between the rocket and the counterweight. This is not practically at all better than the rocket just hitting the hard platform. Springs work because they do not have huge inertia. I think you still end up with an active cradle that gets you the last 0.5-1 meter. Whether on sea or land. A grasshopper like vehicle that starts with baby steps (centimeters or less) then working up to simulate returning boosters is only logical. One of the biggest advantages, other than weight and leveling the booster, could be having a TEL readily attach to a cradle then lower the stage to horizontal. Then it can be protected from the elements quickly. It's a reach and longer term development no doubt, but it's interesting to think about. While the final payload might only increase by ~10% of the removed mass, depending on the orbit, the amount of extra propellant in the S2 could be considerably more. That might be meaningful for S2 recovery and reuse where margins would be very tight. The idea is to have a set of wires (or solid beams). The wires would move in to catch the booster by using a set of sensors. The booster would have retractable hooks (these could even be combined with grid fins if the ITS has them). Once captured, the booster would hang from the hooks. After engine cutoff, the cable supports can easily move the booster onto the launch mount. It can lower or raise the booster by slackening or tightening the cables. - The actual launch cradle is fixed, which allows it to be more robust. - The system can also be used to load the booster onto a carrier vehicle for moving the booster away for maintenance or storage. - The same capture system can be used for different sizes of boosters, including F9, and upper stages. This is a variant of the above, inspired by the snare grappling system used by Canadarm. The wires are rolled into dispensers that control the tension of the wire. Each wire is attached to a rotating ring. There are 6 wires, 6 dispensers, and six rotating rings. This system is a bit more complex, as the weight of the booster is supported by the tension control drums. It does offer more redundancy though. Hey, it's my old "grapple snare" idea from years ago for securing Falcon on the drone ship! I'm sure there's scope for discussion about some Heath Robinson/Rube Goldberg affair using the kind of powerful fans used in skydiving simulators, but to push the sides of the rocket. It would have the advantage of being a 'no touch system'. Note to mods: is there room for a sandpit/Rube Goldberg thread for those of us who are engineering challenged. My vote is for swarm of tiny drones to push booster sideways. fans, arms, cables, bees...we'd be in for a real treat of blooper reels. Ill throw my guess into the ring: magnets. NASA/SpaceX Rocket Recovery Beekeeper would sound impressive on any resume. Why are people ridiculing this? 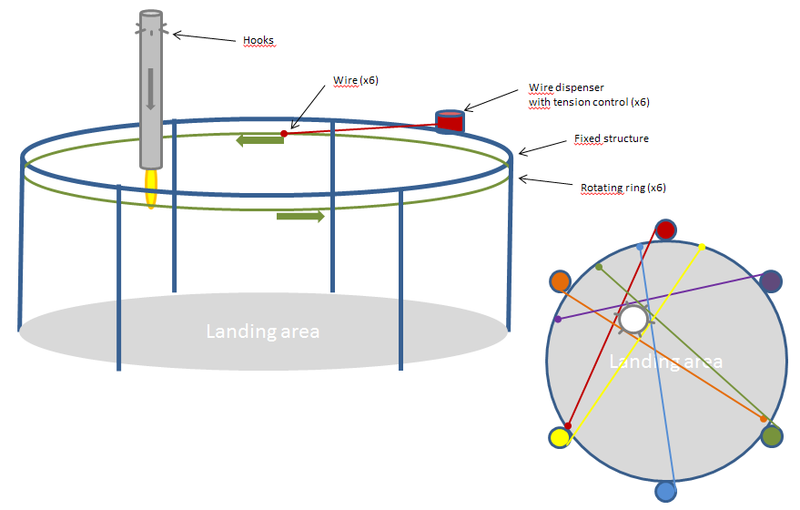 Landing without legs is an idea that should be taken very seriously, it is based on something that Elon Musk actually showed on stage. It wasn't so very long ago that landing at sea was ridiculed but then SpaceX announced they were going to do it and then did it successfully multiple times. The current F9 landing legs are detachable and optional. It would not be unreasonable to design a separate landing gear that is lighter and designed to be "grabbed" by heavy equipment on the ground instead. Since all of this happens without customer payloads on board it is relatively easy to experiment and SpaceX can easily afford to lose some recoveries. 1. The ASDS had to communicate with the F9. 2. They should have a swarm of drones to measure and communicate wind speed at various altitudes. 3. They should add complicated flying wire systems or inflatable "catcher's mitts" to help support the rocket. What SX did was have the ASDS hold station and land where the ASDS should be. If they do a cradle, I expect them to make it the rocket's responsibility to get darn close to the cradle and the cradle to compensate for a meter or two max. No lassos, inflatable catcher's mitts, sky hooks or giant chop sticks. Maybe bees though. The bees have real potential. I'm hearing a lot about bees lately. ....If they do a cradle, I expect them to make it the rocket's responsibility to get darn close to the cradle and the cradle to compensate for a meter or two max. No lassos, inflatable catcher's mitts, sky hooks or giant chop sticks. Exactly. The F9 will do it's job and the cradle will be active and will very quickly make up the last distances in 3 axis's. Maybe less than a meter. What technology it would use to sense the stages position through rocket exhaust would/will be interesting. Regarding Bee's people are saying great things about the bees, they are huge bees, the best bees. Well, assuming that they put up some lightening towers around the landing sites, (surprised nobody has considered what kind of a lightening rod a landing stage would be) small radar units could be installed at a far enough distance and height to triangulate the exact position of a stage as it descends. this data would be relayed to the capture device, which would move and elevate to compensate appropriately. You forgot to mention placement of the hives and how to protect them from the rocket plume. Bees gotta have somewhere to land one they've done their job!